This example shows how to use Simulink® Design Verifier™ to generate test cases to obtain complete code coverage. You first collect code coverage for an example model configured for Software-in-the-Loop (SIL) simulation mode. Then you use Simulink® Design Verifier™ to create a new test suite that generates tests cases to achieve the missing coverage. Finally, you execute the generated test cases in Software-In-the-Loop (SIL) simulation mode to verify the complete coverage. This example requires valid Simulink® Coder™ and Embedded Coder™ licenses. Make sure an unedited version of the model is open. Before running the simulation, set the model parameters to run in SIL mode and to collect code coverage metrics with Simulink® Coverage™. % Remove any existing build folders. Collect code coverage results using the cvsim command and produce a coverage report. The cvhtml function produces a coverage report that indicates the initial coverage of the sldvdemo_cruise_control model. 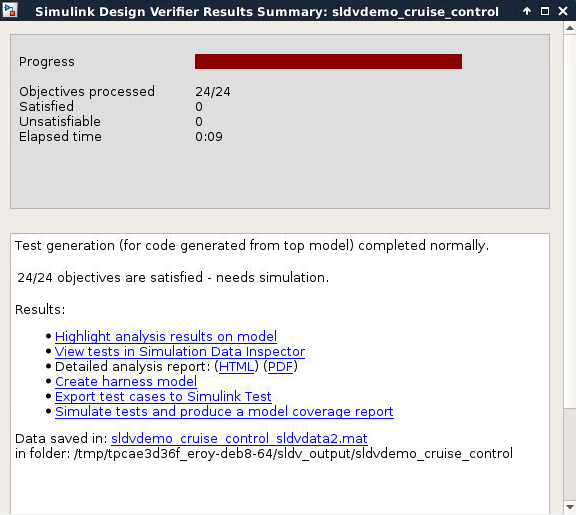 Analyze the sldvdemo_cruise_control model with Simulink® Design Verifier™ to generate a test suite that achieves increased code coverage. 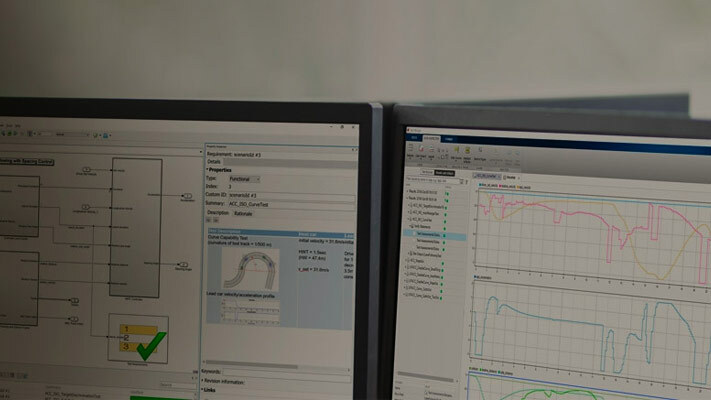 Set the Simulink® Design Verifier™ options to generate test cases to achieve MCDC coverage for the top model. The sldvruntest function simulates the model with the generated test suite. The cvhtml function produces a coverage report that indicates the final coverage of the sldvdemo_cruise_control model.